Another month has come and gone and after going through last month watching fewer horror movies than I had hoped, I’m moving on to yet another themed month. For the month of April, I decided that I want to get some of the bad movies out of the way, specifically many of the awful looking superhero movies geared towards kids, some that I grew up with and others that I’ve never seen and never really wanted to see. 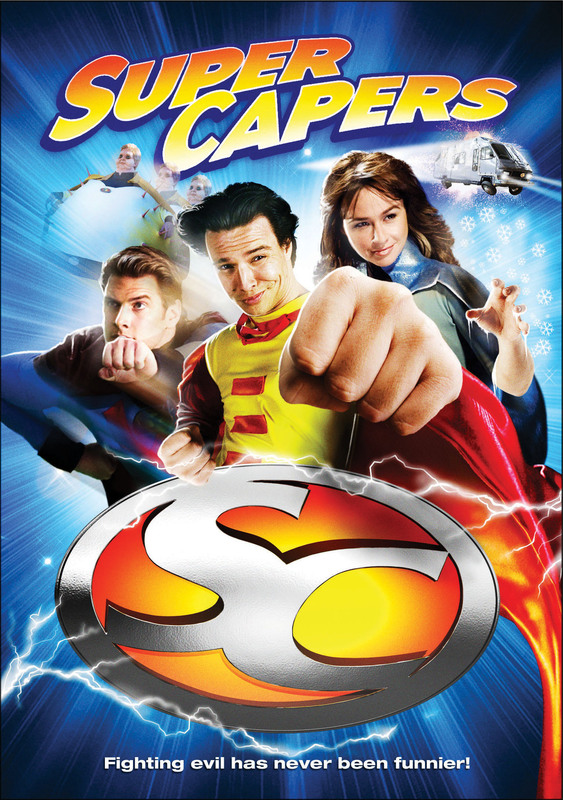 To kick things off, I decided to watch this parody kids movie from 2009 called Super Capers and starring the perennial teen star who would go on to do nothing of note and this was actually one of the last few movies that he worked on before disappearing off the Hollywood planet. The film itself is actually more like a superhero parody film along the lines of Superhero Movie. It has a handful of good jokes, but it’s underscored by way too many cartoonish sound effects that hamper the humor rather than enhance it. And while it has an interesting cast, the actual characters are generally one dimensional punchlines and those punchlines aren’t all that great. It was a bit better than I was expecting it to be, but it’s still a far cry from a good movie. Super Capers is an odd sort of superhero parody movie. It starts out with some odd gags in the credits that make fun of how long they are, and have some almost Police Squad style gags in an early mugging scene. In it, a woman tosses everything in her purse at a potential mugger played by Clint Howard including her gun which he then immediately turns on her. It makes an unusual twist where the mugger gets tossed into a sleazy lawyer’s office who takes the hapless hero played by Justin Whalin to court. From there, it turns into a rather basic story where he’s thrown into the the superhero C-squad called the Super Capers. It’s presented almost as a training camp for super heroes, but it includes one hero who’s practically retired and another who seems to be just towards the end of his prime. Whalin plays Ed Gruberman who was initially a hero telegram guy without any super powers who is a fan of the Dark Winged Vesper aka basically Batman. There is an overlying mystery involving a mysterious woman named Red who was also the woman in the opening scene and some gold bars, but it’s played more for laughs than anything resembling a coherent story. What was most disconcerting about the humor was the incredibly overbearing cartoon sound effects. Nearly everything was punctuated by something that you would hear in a Loony Tunes cartoon, but it generally felt like it was there because the filmmakers didn’t think a younger audience would get the jokes so they needed something to punctuate it. Which is a shame because there were some decent jokes sprinkled throughout the film that were weakened by the hammy sound effects. What did work in the sound department were the well done audio homages to Back to the Future and Star Wars. The vehicle that the Super Capers roam around in is an RV made up to look like BTTF’s Delorean, and every time it was on screen the score changed to a well done parody/homage to that film’s iconic score. The same was true for the Star Wars references as Whalin comes to discover that the judge that sentenced him to join the Super Capers was also: his father, the Dark Winged Vesper, the man who killed his parents or technically his mother and stepfather, and was working with Red from the very beginning. The rest of the team of Super Capers are a bit of a mixed bag in terms of characters. Most of them are there for either their specific usefulness to the story or for a gag. First off is the leader Sarge, played by Tiny Lister. He’s essentially just used as a one note joke as the big angry guy. He never really has any fight scenes, he’s just there to yell at Ed. Next up is Will Powers who is the Superman-esque hero who spends most of his time doing TV commercials and worrying about his looks. There’s also Herman Brainerd who supposedly has a giant head, but in actuality just has what looks like a big lump on his forehead, and he also has telekinesis that comes with its own cartoon gross-out stomach gurgling sound effect, and on top of that he has some mommy issues with a mom played by June Lockhart. Next up is Puffer Boy whose power is what you might expect based on his name, when he gets scared he turns into a giant puffer fish and he tends to get scared rather easily. And finally there’s the woman of the team Felicia Freeze who has ice powers and is obviously there to be the love interest for Ed Gruberman. Speaking of the women in this film, it was incredibly regretful to see how the women were portrayed in the film. Both are initially just treated as objects to be rescued and/or flirted with. Both seem to have the hots for Ed Gruberman at some point during the movie even though he really has no heroic qualities. Felicia initially is turned off by him since she’s behind a bar cleaning a glass and Ed incorrectly assumes that she’s the bartender. But she’s impressed when he prays and a lamppost hits the Minotaur creature they’re fighting. Speaking of which, the Minotaur, named Cretan was actually a nice looking creature effect. While it looked like a cross between a Minotaur and the Mooby’s cow from Dogma, it moved quite well for a film with a small budget. There was also a random robot sidekick named Robo who looked and sounded like a metal Arnold Schwarzenegger. While it was a lame joke, the design of the robot looked decent enough. The same can be said of the costumes too, there was enough similarities in the designs of the Super Capers’ outfits where you could tell they were on the same team, and Ed Gruberman’s initial costume also looked like something that would have been bought from a store. Again, there were good points throughout this film, but when it all came together there were just too many shortcomings to really recommend this film to very many people. If you’re a fan of some of the older parody films like the Mel Brooks films or the Zucker Abrahams Zucker films and can look past the cartoon sound effects, there will be enough here to keep you interested at least. It’s still a far cry better than most recent parody films that end with “Movie”. Until next time, this has been Bubbawheat for Flights, Tights, and Movie Nights. Posted on April 3, 2016, in 00's movies and tagged film, kid friendly, movies, parody, review, Superhero. Bookmark the permalink. Leave a comment.